Horrordervs is the most clever subscription service I have ever laid eyes upon. (C'mon, look at that name!) At a mere $17/month, you get an entire package full of hand crafted and hand selected horror goodies. So much love and care goes into Horrordervs packages and I am telling you about it with the strongest recommendation. Sign up for Horrordervs right now. You won't be disappointed. I was so excited and so happy when opening this month's Horrordervs that I legitimately almost cried while unboxing. I'll spare the details and just let you dig into the unboxing yourself. PS: Check out Horrordervs on Facebook and Twitter to keep up with giveaways and promotional things! Hey pals! I am SO behind on blog posts it's unreal but I received some EXCELLENT mail this week and I couldn't wait to get some unboxings filmed and up on the Girl Terror YouTube channel. This month's Box of Dread is here and it was radical. 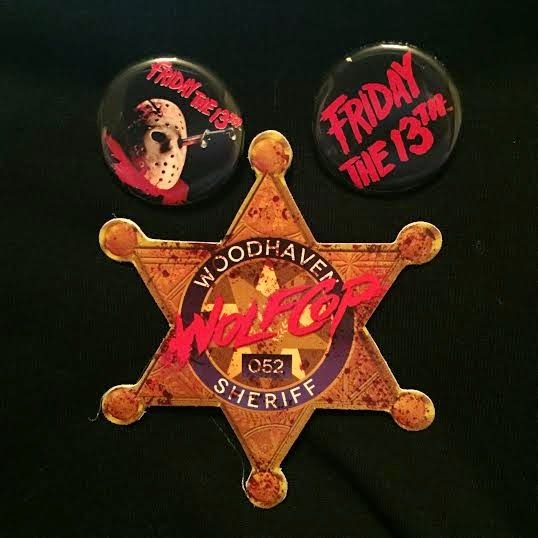 Take a peek at all of this month's Friday the 13th and Wolfcop goodness! NOTE: Thanks to subscriber GiVeNuP96 for pointing out that there were 3 pins I missed while unboxing! Sometimes you see a film so wonderful, you can't wait to share it with everyone you know. Written and directed by award-winning Australian director Nicholas Verso, The Last Time I Saw Richard (prequel to the upcoming full length, The Boys in The Trees) is the best short film I've seen lately. Jonah (Toby Wallace) is an antisocial, self-harming teenager at a mental health clinic in 1995. When his new roommate, Richard (Cody Fern) arrives, Jonah struggles to make a connection with him. Jonah suffers from haunting nightmares and a friendship develops when he discovers Richard experiences them, too. Terror ensues when Jonah is able to see into Richard's bad dreams. For a short 20 minute run time, The Last Time I Saw Richard is complex. It explores mental health in a very real, very scary way. Verso explores male friendship, the sensitivities within an emotional bond, and the beginning of a deeper relationship. The film is dark but the true fear lies within the characters trying to control their own demons. The Last Time I Saw Richard boasts incredible production value. Visually, the film is imaginative and stunning, while surprisingly minimalist for its subject matter. The true standout piece from this film, though, is the on screen relationship between the actors. Toby Wallace and Cody Fern bounce off each other with ease. Their characters' relationship almost crosses a romantic border and I wanted to see more of that, and them, which is always a positive sign for an effective short film. Watch the film below and keep up with Nicholas Verso at http://www.nicholasverso.com!